Effective Phrases for Performance Appraisals by James E. Neal Jr., now in its tenth edition is a great book and a must read for anyone writing an employee performance review. Not just for managers, employees can use it too! 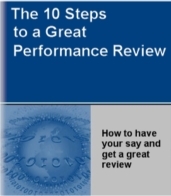 Ever since I came across this book around three years ago I have used it every year when writing my employee performance review - both during my mid-year review and my final or end-year review. In the company I work for, the performance evaluation form has a large section that I need to complete and I have found the Effective Phrases for Performance Appraisals to be a very useful resource. Although the book is designed to be used by managers when writing performance evaluations it actually does a great job of also assisting employees with phrases, adjectives and verbs to use when writing their own reviews. In fact, my boss told me to buy it! I had already written up my performance appraisal and given it to my boss for review. She took a look at it and told me to re-write my review using the Effective Phrases for Performance Appraisal book so that it would come across more positively, and accurately reflect the level of performance that I had exhibited during the year. My review was lacking the effective phrases for performance appraisal which was more than made up by this book. This guide will help you write better reviews! Once I had finished re-writing my employee performance review using the words and phrases from this book it was as if a whole new dimension had been added to my writing. Suddenly, I had found good and useful words to use which made the writing come alive and in a manner that was much more positive with respect to my achievements. The words and phrases in the Effective Phrases for Performance Appraisals book accurately describe a variety of commonly related factors used in performance appraisals. The phrases are extremely positive and reflect superior performance. By simply altering a phrase you have written using the words and phrases from this very useful book you can make a dramatic difference to your review. I have now used this book several times and there is only one thing that I found I need to point out so you can make the most of it. Remember, the Effective Phrases for Performance Appraisals book was originally written for managers. But, as I said before, this is the best resource employees can also use to write up their reviews. So, when you are using this book to get some ideas to write up your own employee performance review, remember to change the words and phrases slightly so it comes across from your point of view - i.e. you as an employee writing your own review rather than your manager giving their view on your performance. This is the only thing you need to watch out for when you write your own review. Want your boss to give you great reviews? Now, if you want your boss to write a great review about your performance then how about giving your boss a loan of this book? Imagine what a great relief you will be bringing to your boss during review time just by loaning this book. Most managers struggle to write reviews. In fact, they dread it! Their brain freezes after writing the first few performance reviews. Guess what happens when your turn comes? Yep, you got it. The feedback appears pretty ordinary. Do your boss a favour and loan this book to them. Be honest. Tell them that you have also used it and they will find it very useful too. In fact, it will also save them a whole lot of time thinking about what words and phrases to use. And, you win in the process by getting a better review! A great review for the cost of a sandwich?? For around $12 which is how much you would pay for lunch on any workday you get a book that remains a useful resource for the rest of your working career. And, if you are a good performer you may even score a higher rating or at best make a very good and fact based impression about your performance with others when they read your review. Go ahead and get it now. I did not regret the decision and I know you won't.